Breathe a little...Slow down...: OMG!!! A BFP on 12dpo! I couldn't believe it. Thanks to the bak foong pills and bak zhen. But I think it was the bak foong pills as I only started taking it last month after my period. And there, I got a BFP! Yesterday evening after work, since I have a number of cheapies opk to spare, I pee'ed on them again as I was already suspicious because of the dark positive it gave me 2 days ago (11dpo). 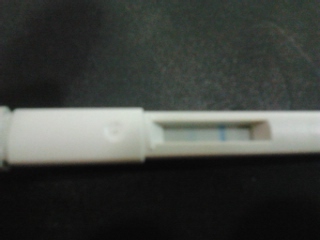 Guess what, it gave me a dark positive almost immediately again, which seldom happens even during ovulation. So...... I couldn't help but tested with 2 different brands on upt, and yes, two lines, faint lines, but it's there. Level of hcg is still low, due to very early stage. My period will not be due until this Friday. So, I tested 3 days early. But still, I am very happy already because the lines are there! Hope this would be a sticky bean. God, please forgive me for what I've said last week, that I hated You, that You were unfair and nothing good ever happened to me. God, please forgive my wrong doings and sins, my everything. I pray that Wong will have good health, long life, longer life than mine. I pray Kenzie will be happy and healthy everyday, free from harm, danger, sickness, falls, bug bites, everything. I thank God for this baby, and that I could conceive naturally. I pray that this baby sticks and to have a smooth natural pregnancy as how I had with Kenzie. I pray this baby will be healthy and normal. Let me get through the next 9 months smoothly. I pray everything will be just fine. I leave everything unto You. In God's name I pray, Amen.